We are committed to a sustainable future because we value the environment and its impact on people and wildlife. Not only are we striving to minimise our carbon footprint, we also endeavour to extend special care to people in need within Australia and overseas. We established the API Foundation in June 2010 as vehicle for our community giving program – simply because we care. Our charitable giving is by way of active participation, donations and business support to those organisations embraced by the API Foundation. Rob Skipper and Andrew Cook were delighted to continue API Insurance Services’ support of Volunteering SA&NT by marching in their National Volunteers Week parade. 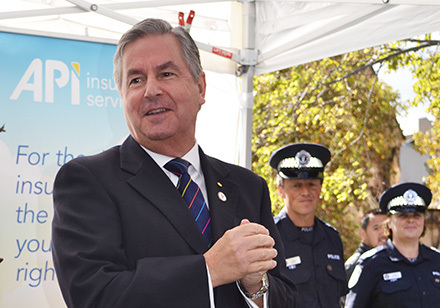 His Excellency, Rear Admiral Kevin Scarce AC CSC RANR, Governor of South Australia was also present to lend his support as Patron of this active and caring volunteering body.